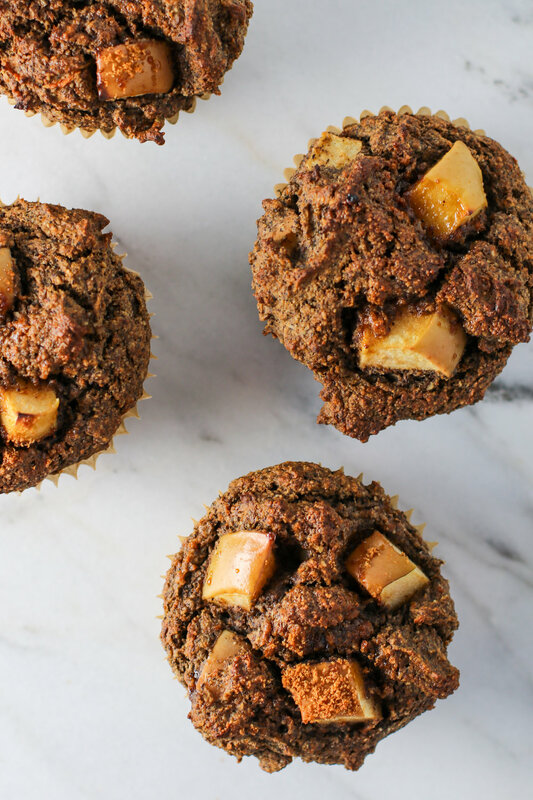 Apple Cinnamon Sweet Potato Muffins — Erin Parekh | Live Well, Simply. I meant to post these muffins earlier in the week — but as I’m sitting at my business partner Sarah’s house with my coffee and looking at snow (instead of my sunny palm tree view back in FL) — today seems very fitting. These warmly spiced, apple and sweet potato muffins are the perfect January breakfast or afternoon snack with some tea. They use the tiniest amount of maple syrup to round out the flavors, but are otherwise sugar free — instead getting their sweetness naturally from the mashed sweet potato. I used buckwheat and sorghum flour here, but oat (or spelt if you are gluten-tolerant) would work well too. Try saving a few pieces of apple to dot on top of each muffin for a pretty bakery effect. Preheat oven to 400 degrees and line a 12-cup muffin tin with parchment paper muffin liners (or grease well with coconut oil). In a medium bowl, combine sweet potato puree, eggs, maple syrup, apple sauce, coconut oil, and vanilla. In a large bowl, combine the buckwheat flour, oat flour, ground flax meal, baking powder, baking soda, cinnamon, allspice, and salt. Gently fold the sweet potato mixture into the dry ingredients until just combined — do not over mix. Stir in the diced apple. Evenly distribute the batter among the prepared muffin cups and sprinkle coconut sugar over the tops. Bake for 20-24 minutes, until the tops are brown and a toothpick inserted into the center comes out clean. Let cool 5 minutes, then remove muffins from tin and place on cooling rack until completely cooled. Muffins will keep at room temperature for 2-3 days or in the fridge for up to five day. Reheat in the toaster oven if desired. Note: To make the sweet potato mash, bake two medium sweet potatoes at 400 degrees for 40-60 minutes (depending on size). Once they are soft and can be easily pierced with a knife, let them cool. Then remove the skins, mash, and measure. Any leftover sweet potato is delicious seasoned with a little salt, pepper, and olive oil and served as a side.